Amid this year's announcement of a snook restocking initiative (original story below), Mote’s Fisheries Ecology & Enhancement Program also continued its own snook studies that could help inform snook-release efforts expected to ramp up in 2019. This year, Mote scientists released approximately 5,461 hatchery-reared, PIT-tagged snook into Phillippi Creek and North Creek in Sarasota County. “This is the most fish we've released in a single year since 2004, and they all came from a single spawning event, which highlights the great improvements in snook production that our colleagues at Mote Aquaculture Research Park have made over the last few years,” said Mote Postdoctoral Research Fellow Dr. Ryan Schloesser. Orlando, FL – Sept. 10, 2018 – Coastal Conservation Association Florida (CCA Florida) is partnering with the Florida Fish and Wildlife Conservation Commission (FWC) and Mote Marine Laboratory (Mote) to address the loss to the snook population on the southwest coast as a result of the red tide event. The initiative includes raising and releasing 5,000 hatchery-reared juvenile snook along Florida’s southwest coast and will launch in April 2019 following the Florida red tide bloom and when waters are determined to be safe. Fundraising for the program will include outreach to the community through an Adopt-A-Snook program and the formation of additional private-nonprofit partnerships. Snook are one of the most sought after catches by anglers in southwest Florida, and they return to the same beaches to spawn annually during summer. Unfortunately, summer was also a peak time for red tide toxins along the beaches of Gasparilla and Little Gasparilla Islands. 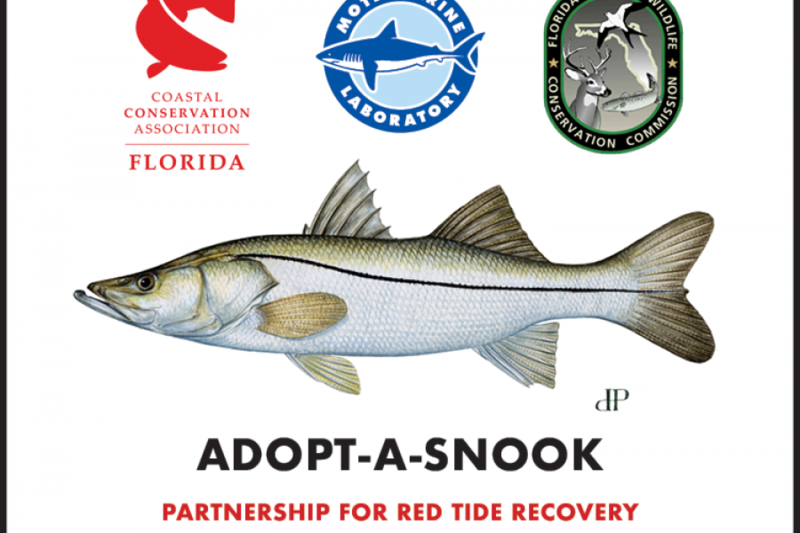 In addition to the stocking enhancement initiative, the organizations are encouraging anglers to help the snook and other inshore populations by releasing their catch. 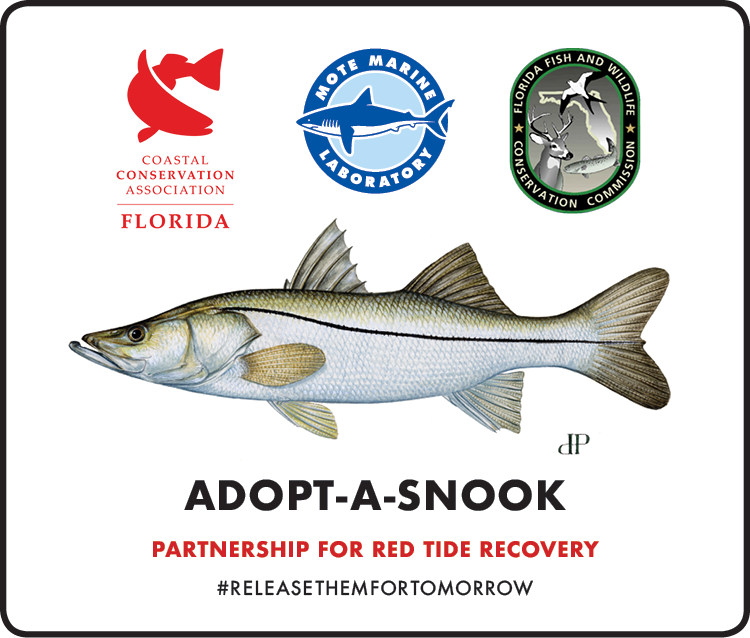 This summer, CCA Florida launched the “Release Them For Tomorrow” campaign as a way to support several species’ growth through catch and release, including snook. “It is going to take everyone doing their part to get our fisheries back to health,” stated Gorski. Anglers are encouraged to share the message by tagging their social media photos, comments and messages with #ReleaseThemForTomorrow to show their support. Anglers can become engaged by joining CCA Florida at JoinCCA.org. For more information visit the Facebook page or ccaflorida.org. The Coastal Conservation Association (CCA) was founded in 1977 after drastic commercial overfishing along the Texas coast decimated redfish and speckled trout populations. One of 19 state chapters, CCA Florida became the fifth state chapter in 1985. A 501(c)3 non-profit, the purpose of CCA is to advise and educate the public on conservation of marine resources. Through habitat restoration projects, water quality initiatives and fisheries advocacy, CCA Florida works with its over 18,000 members including recreational anglers and outdoor enthusiasts to conserve and enhance marine resources and coastal environments. Join the conversation on Facebook or learn more at ccaflorida.org. Mote Marine Laboratory & Aquarium is an independent, nonprofit, 501(c)3 research institution founded in 1955. Mote began and flourished through the passion of a single researcher, Dr. Eugenie Clark, her partnership with the community and philanthropic support, first of the Vanderbilt family and later of the William R. Mote family. Today, Mote is based in Sarasota, Florida, with five campuses stretching from Sarasota to the Florida Keys. Mote has more than 20 world-class research programs studying oceans locally to internationally, with an emphasis on conservation and sustainable use of marine resources. Mote’s vision includes positively impacting public policy through science-based outreach and education. Showcasing the Lab's research is Mote Aquarium, open from 10 a.m. to 5 p.m. 365 days a year. Learn more at mote.org. Florida Fish and Wildlife Conservation Commission’s mission is to conserve fish and wildlife resources for their long-term well-being and the benefit of people. Florida’s fish and wildlife belong to the people of Florida, and the FWC is entrusted to take care of these precious resources. The FWC protects and manages more than 575 species of wildlife, over 200 native species of freshwater fish and more than 500 native species of saltwater fish while balancing these species' needs with the needs of approximately 19 million residents and the millions of visitors who share the land and water with Florida's wildlife. Learn more at myfwc.org.